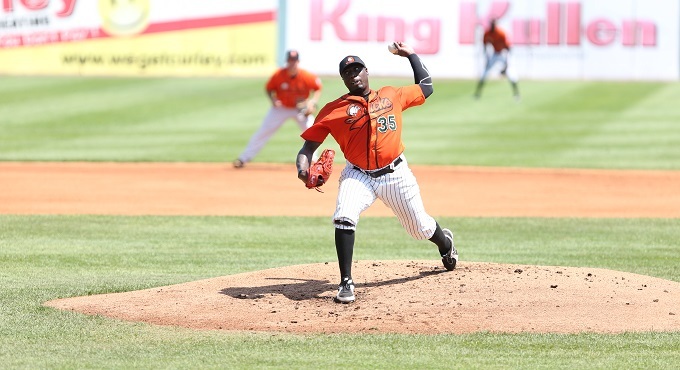 (Central Islip, N.Y., Aug. 4, 2013) – The Long Island Ducks today announced that left-handed pitcher Dontrelle Willis has been signed by the Los Angeles Angels of Anaheim organization. He becomes the third Duck to be signed by a Major League organization in 2013 (Ben Broussard, Royals and Eric Niesen, Red Sox) and fourth overall (Danny Perales, Mexico). Willis has compiled the best earned run average in the Atlantic League this season, posting a 2.56 ERA through 14 starts. The southpaw has a 5-4 record and has struck out 52 batters in 87 and two-thirds innings. He is tied for second in the league in complete games as well with three. The 31-year-old’s efforts this season earned him an Atlantic League All-Star selection, and he was chosen as the starting pitcher for the Liberty Division, tossing a perfect inning. The former big leaguer has pitched for the Florida Marlins, Detroit Tigers, Arizona Diamondbacks and Cincinnati Reds, combining for a career record of 72-69 with a 4.17 ERA and 896 strikeouts in 205 games (202 starts). The two-time MLB All-Star earned the NL Rookie of the Year Award as a member of the World Series champion Marlins in 2003 after compiling a 14-6 record with a 3.30 ERA, two complete game shutouts and 142 strikeouts in 27 starts. He last pitched in the Major Leagues in 2011 as a member of the Reds, making 13 starts and striking out 57 batters in 75 and two-thirds innings. Willis was originally drafted by the Chicago Cubs in the eighth round of the 2000 amateur draft.